Electronic Arts confirmed back in August that it will launch the next FIFA title on both the Android and iOS platforms this fall. We've been very surprised to discover that the game has already been released on Google Play over the weekend without an announcement going live. However, the game was launched under a different moniker, FIFA Mobile Soccer, possibly in order to emphasize on the fact that this is 100% a mobile game, not just a port from consoles. Veterans of the franchise will be pleased to know that EA has added an all-new Attack Mode, which is a turn-based match offering an asynchronous experience that pits FIFA Mobile from around the world against each other. New controls options have been added as well, such as auto play, virtual stick and gesture controls. In order to provide the level of authenticity FIFA fans are looking for, EA announced that the game comes with more than 30 leagues, 650 real teams, and 17,000 real players. Another aspect that EA seems to be proud of is the fact that FIFA Mobile Soccer's size downloads in under 100MB, which means that fans can get it even without a Wi-Fi connection. It's also worth noting the game now features support in many different languages, including English, French, Brazilian, Portuguese, Russian, and Turkish. EA confirmed that the game will work on mobile devices running Android 4.1 and iOS or better. As mentioned in the title, for the time being, FIFA Mobile Soccer is available on Android devices, but we suspect the iOS version is going to be released very soon. FIFA Mobile Soccer is available for free and requires a persistent Internet connection. Obviously, it comes with in-app purchases, so if you don't want to spend any money you can disable this feature from the Settings. I hate that it requires persistent internet connection which means your battery will drain faster. I, for one, will try this tonight! Pre-registered. Always preferred the Dream League games on mobile because FIFA didn't play nice with the touchscreen. Looking forward to this one! 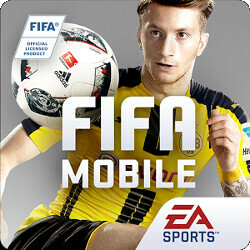 Good to see Marco Reus on the cover as opposed to Messi, Neymar or Big Ron. Top, top player that probably doesn't get the recognition he deserves. If he wants to get recognition he should go to the bigger like Barcelona or Real Madrid. Bigger teams* can't edit on mobile. Do it support Android TV? would be pretty cool on Shield TV.